Outdoor activities like surfing, and hiking can be exhilarating. However, no one wants to have to be worried about the safety of his or her belongings especially as a surfer. Therefore, we have designed the RokPak and have gone the extra mile of conducting extensive research into the world of the surfer to see how best the RokPak can be designed to suit them. • Built in LCD display which enables the surfer to be aware of the amount of battery power left without being a distraction from your surfing. • The Built in LCD display also has the function of informing the surfer of the ports which are currently in use. • The RokPak is designed to protect the surfer’s devices against external shocks such as those which may be incurred from physical movement which encounter hard pressures like rough waves encountered by the surfer. • The water activated LED SOS feature is also complimented by the fact that the RokPAk is water proof as such the surfer need not be concerned about its durability. • There is a built in solar panel which facilitates efficient use of power to recharge to the RokPak even whilst the surfer is in his/her prime. This solar panel also has the benefit of being shatterproof. • Designed to be charged with a micro USB charger or car charger, perfect when the surfer is in far out locations. • There is also a 4 function LED flashlight which features a low and high intensity display, one that pulsates as well as the SOS feature. All these make RokPak the ultimate surfer companion! RokPak is designed to safely house your smartphone and other electronic devices (protecting them from water damage whilst surfing), keys, wallet, drivers’ licence and other personal items. Not only does RokPak keep them dry and ensure their safety it also acts a protection from sand particles that are almost impossible for a surfer to escape, especially in speaker openings as well as charging ports on smartphones and other electronic devices. This is critical as it is well known that sand particles can damage the sensitive internal electronic parts of devices. The RokPak is able to provide charge for your GoPro to ensure that your ability to capture beautiful footage with no concerns for damage to it whilst surfing. 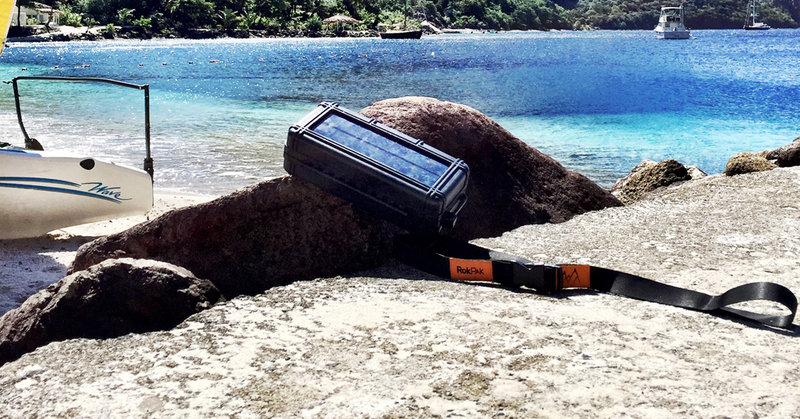 The RokPak is truly revolutionary as it also features a built in solar panel which harnesses the sun’s energy to ensure whilst surfing, it is charging. Understandably a concern you as a surfer has is how will you find the RokPak if it falls into the water. Therefore, the RokPak is designed with an LED SOS beacon easily seen by a surfer, automatically activated once it hits the water. To that end, not even extreme surfing seen in extreme surf videos will make it easily lost. But there is an off switch because the light will not always be useful to the surfer. Some of the more popular surf videos show that surfer teaming up very popular. Therefore the need for functioning electronic equipment is not confined to one surfer. Therefore, the RokPak has been designed with two charging ports so as to ensure that the other members of your surfer team are as ready to perform as you are. The RokPak is specifically designed to withstand both internal and external pressures. Therefore several heavy electronic items can be stored by a surfer without damaging the interior. In addition, should someone step on it or should you fall and its acts a fall breaker, you need not worry that the content inside will be damaged or that the exterior will be damaged. It is unlikely that your surfing activity will be in close proximity to a building which has many (if any)) electrical ports thus the charging capability of the RokPak is designed to be compatible for use with a USB car charger. Really, the RokPak is a device for all seasons and true to its name the RokPak is designed for the surfer who rides rough and enjoys the outdoors and in so doing contends with nature. So surf’s up, with RokPak the ultimate surfer companion. And a Bikini babe to carry it.